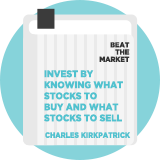 Charles Kirkpatrick Bargain is a rules based strategy inspired by US investment strategist Charles Kirkpatrick's work in his excellent Beat the Market. Kirkpatrick has established strategies for finding growth and value stocks. His bargain strategy concentrates on value and momentum factors, with a very precise requirement for the price to sales ratio. Kirkpatrick's testing of of relative price-to-sales ratio rankings found that it was most effective between the 17th and 42nd percentiles in terms of cheapness. Initial testing of the Bargain Model was promising but Kirkpatrick said that several more years of testing were needed before labeling it a success. Kirkpatrick wrote: "As a result of these studies of relative selection methods, I decided to create a new list, called the 'Bargain List' that would incorporate the best triggers found so far and would only include value and price strength." President of Kirkpatrick & Co., Inc., a specialist in technical research. Author of "Beat the Market: Invest by Knowing What Stocks to Buy and What Stocks to Sell"
In his book, "Beating the Market", Kirkpatrick tested his Value Model from 1998 to 2007, where it outperformed both his own Growth Model and the S&P 500 index.